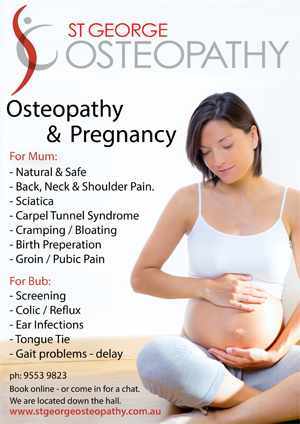 Osteopathy and Pregnancy @ St George Osteopathy. During pregnancy, a woman’s body must adapt to the gradual increase in her weight and shift of her centre of gravity, as well as make room for the baby as it grows. To do this, her body needs to be strong and flexible. Any old injuries, underlying muscle tightness, joint restriction or pelvic instability will impair her ability to adapt and may result in pain. Although back, neck, pelvic and leg pain is very common during pregnancy, it is a sign that the body is struggling and needs help. • Pre-conception – to help make sure your body will cope with the changes of pregnancy and help it to adapt as smoothly as possible. • During pregnancy – to help the body adapt to the postural demands of the growing baby. Maximizing pelvic mobility can also help to minimize the chances of a problematic labour. • Post-natal – to help you recover from the birth. Treatment is aimed at gently easing sore and tired muscles and rebalancing the pelvis. It can also help relieve back pain from breast feeding and lifting the baby and to optimize your milk flow. In addition, lymphatic drainage can help reduce swelling, improve your circulation and reduce the chances of mastitis. When necessary and upon your request, liaising with your midwife, obstetrician and GP at all stages is common practice, in order to provide the best overall care for you and to address any concerns you may have. Being pregnant is a unique and powerful life experience. It is a time that can, and should be enjoyed. So if you are in pain and to improve your overall well being during this exciting time in your life and make an appointment today. Safe, effective treatment for pregnancy pain.